Aug. 4, 2017: On July 5, 2017, NASA’s Solar Dynamics Observatory watched an active region—an area of intense and complex magnetic fields—rotate into view on the Sun. The satellite continued to track the region as it grew and eventually rotated across the Sun and out of view on July 17. With their complex magnetic fields, sunspots are often the source of interesting solar activity. During its 13-day trip across the face of the Sun, the active region—dubbed AR12665—put on a show for NASA’s Sun-watching satellites, producing several solar flares, a coronal mass ejection and a solar energetic particle event. Watch the video below to learn how NASA’s satellites tracked the sunspot over the course of these two weeks. 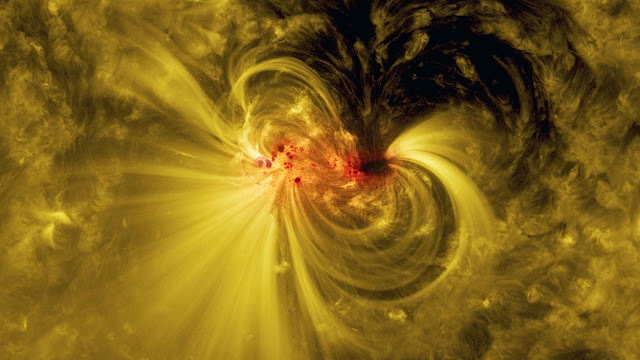 This image shows a blended view of the sunspot in visible and extreme ultraviolet light, revealing bright coils arcing over the active region—particles spiraling along magnetic field lines.